Creative Pixar: Scientists have created the first telescopic contact lens that will give people the power to zoom their vision almost three times. The outside edge of the contact lens acts as a telescope capable of magnifying sight by 2.8x, around the same amount as looking through a 100mm lens on a DSLR. 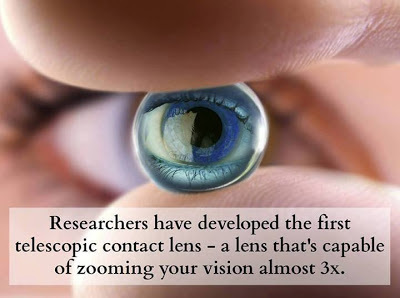 Scientists have created the first telescopic contact lens that will give people the power to zoom their vision almost three times. The outside edge of the contact lens acts as a telescope capable of magnifying sight by 2.8x, around the same amount as looking through a 100mm lens on a DSLR.